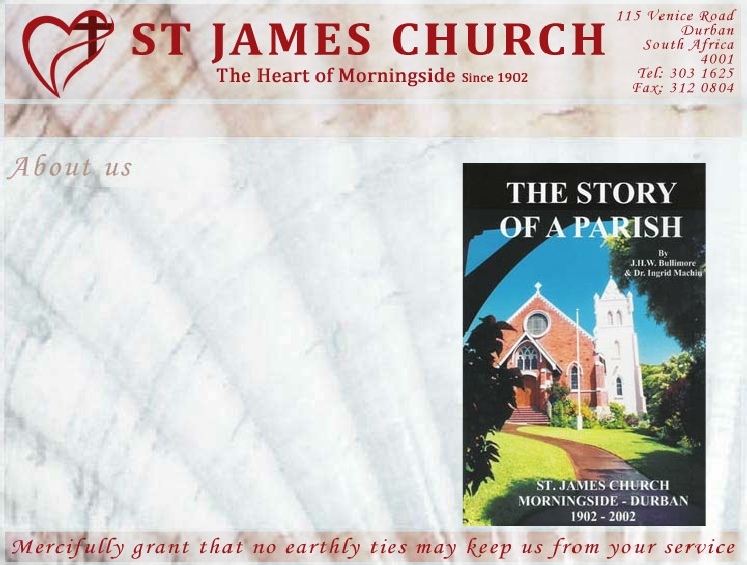 Thank you for dropping in on our Web Site here at St. James, Morningside, Durban , South Africa . Our church is situated in the green and leafy sub-tropical suburb of Morningside on the Berea , overlooking the great Port City of Durban, the largest port on the East Coast of Africa. Although the history of the Parish goes back to the late 1800's, the foundation stone of the new church building, Dedicated to St. James the Apostle, was only laid by the then Governor of Natal, Sir Henry McCallum, on Saturday 20th December 1902. Thus, St. James Church had its roots in the Colonial years of Natal and was the "Spiritual Home" down the years for all who resided at "Kings House" the Governor's home just a short walk up the hill from the church. Over the years St. James has not only hosted members of the British Royal Family (the King and Queen in 1947 and more recently the Duke and Duchess of Gloucester), but also Members of the South African Government, including our now retired State President, Mr Nelson Mandela. However, St. James, while thankful for it's past history, is not a museum! It is a vibrant family Parish, exercising a pastoral ministry to the people of Morningside and beyond. Under God the Holy Spirit and the direction of the two clergy on the staff, we have a "holistic" ministry, shared extensively by laity teams. We are thus able to offer a happy Family and Children's ministry; an exciting Anointing and Healing ministry; pastoral teams visiting newcomers and meeting the needs of those in hospital and at home; house groups where in-depth bible study takes place and two Intercessory prayer groups holding the needs of Durban and all her people, before God. A number of exciting Training opportunities are offered: "The Alpha Course"; "The Marriage Course"; "The Marriage Preparation Course" (video-based courses from Holy Trinity Church, Brompton, London); A Parenting Course; "A life worth Living"; "Living with Loss" (a course for those recovering from divorce or separation) and a Bereavement Course. An exciting recent development is our "Time-out for Families" gathering of parents and children. Keeping pace with the needs of our community we are "twinned" with a new church planting in Cato Manor, a vast "squatter area" on the fringe of the City. We are involved with a "Food-Bag" feeding scheme for the poor; unemployed and "Child-Headed Households" as a result of the scourge of HIV / AIDS; training in AIDS counselling and Home Based Care and thanks to generous donors in Massachusetts USA, we are busily equipping crèches and Primary Schools with teaching aids and books for their libraries. All this is in addition to the heartbeat of Worship both in English and isiZulu, using Anglican Prayer Books, with a strong Choral Tradition, through to our more Informal Services with our Music Group. Fuller information on our past history can be obtained by reading 'The Story of a Parish" published at the time of our Centenary Celebrations. At R25.00 a copy, this may be ordered through our Parish Office. "To Glorify God through being a Loving; Caring; Compassionate and Spirit filled Parish; Cherishing our diversity and Acting according to God's Word and Will; To make a positive impact on our Family life and Community".